While it is illegal for anyone to drive under the influence of drugs, truck drivers may lose their job if they test positive—even if they aren’t high when driving. 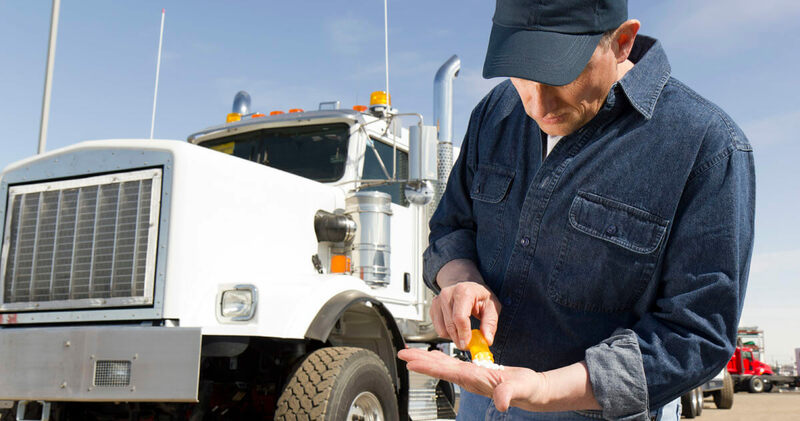 The Federal Motor Carrier Safety Administration and the Department of Transportation (DOT) have strict rules regarding drug testing for truckers, and for anyone who applies for a job where a Commercial Driver’s License is required. Here are some of the basics you need to know. Before you can be officially hired, you must pass a pre-employment drug test. After that, trucking companies must have a system in place for random testing, scheduled testing, post-incident testing, and pre- and post-suspension drug screening. Urine tests are the most popular, but since hair follicle testing is a bit more in-depth—you can expect either. At present date, the drug test screens for amphetamines, cocaine, marijuana, opiates, and PCP. Can Prescription and Over-the-Counter Meds Cause a False Positive? These are just a few that can register a false positive. Also keep in mind that the generic equivalents may have different names. Always let your doctor and pharmacist know you have a CDL and ask if there are any alternative options. If you fail due to a false positive, you will have to provide documentation from your doctor, and possibly take another drug test. As more states legalize marijuana, the question is often asked whether legalization removes marijuana from the screening results. The answer is a resounding no. The legality of marijuana is quite tricky; while it may be legal in your state, or the state you’re driving through, for either or both medicinal or recreational purposes, it is still illegal on the federal level. This means that truckers (and many other professions) strictly prohibit the use of marijuana—even if you have a doctor’s permission, or if it is legal in your state. Do You Have to Fire a Driver Who Has Failed a Drug Test? It is a shock when one of your tenured and reliable drivers fails a drug test. While you do not have to fire them, the DOT requires you to remove them from safety-sensitive job duties. In many trucking companies, there may not be any other employment option. Companies are at their liberty to suspend without pay, or fire. Refusing a drug test requires the same response and procedures as a failed drug test. Can Drivers Return to Work After Failing a Drug Screening? A failed drug screening will either leave you unemployed or suspended. However, if you follow the proper channels you may be able to regain eligibility. Drivers will need to be evaluated by a DOT-qualified Substance Abuse Professional (SAP), and complete the required training and treatment plan. Once complete, they must have a follow up evaluation with their SAP. If you regain employment, your SAP will complete 6 random tests over the next 12 months. This is in addition to your employer’s screening procedures. While you may regain your eligibility, this does not guarantee employment. In fact, it will likely be difficult to find a company willing to be the first to hire you after a failed screening. Insurance premiums will skyrocket and you may have problems finding an insurance carrier willing to accept your risk. And remember, refusing to take a drug test will be treated as if you failed a drug test. Always talk with your doctor, pharmacist and employer before taking any drugs, regardless of whether they are legal, over-the counter or prescribed. It’s not worth killing someone or losing your livelihood. Hunter Tires Sells Affordable Semi Tires.